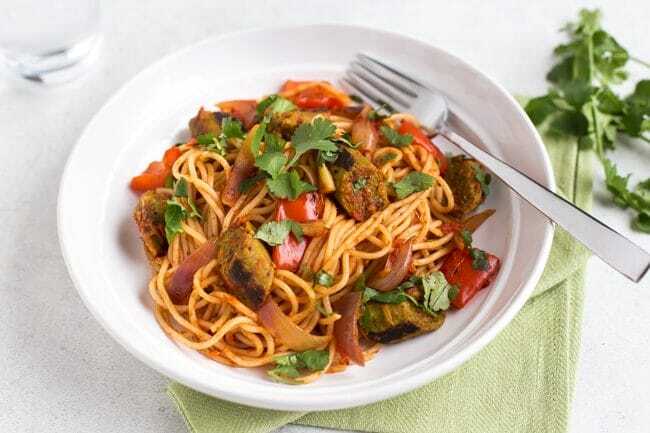 A super tasty vegan pasta dish with a rich tomato sauce and curried sausages. A super flavourful vegan pasta dish – curried sausage pasta, with veggies and a rich tomato sauce! 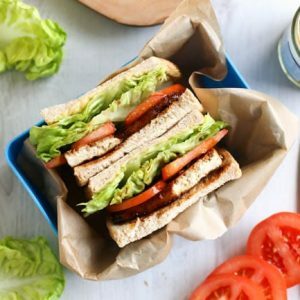 During Veganuary, I’ve been trying not to completely cut out my favourite foods, but rather I’ve been finding vegan versions of them. I tried a vegan pizza (shop-bought), which was surprisingly awesome. 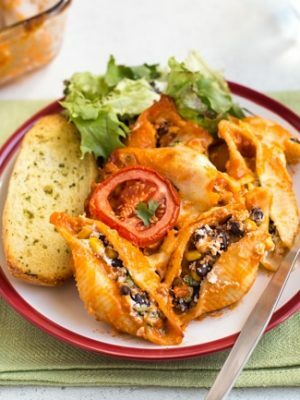 And despite usually loading my pasta with cheese, I’ve been making vegan pasta dishes too! 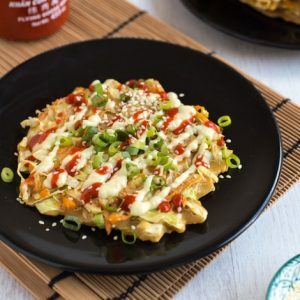 I’ve been playing with flavours that you wouldn’t expect to be served with cheese in the first place, so it doesn’t feel like there’s anything missing. 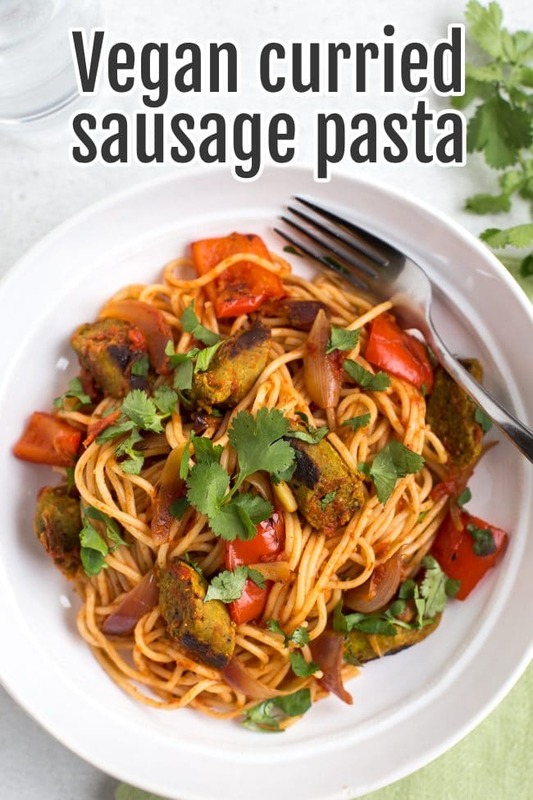 My favourite so far is this vegan curried sausage pasta! 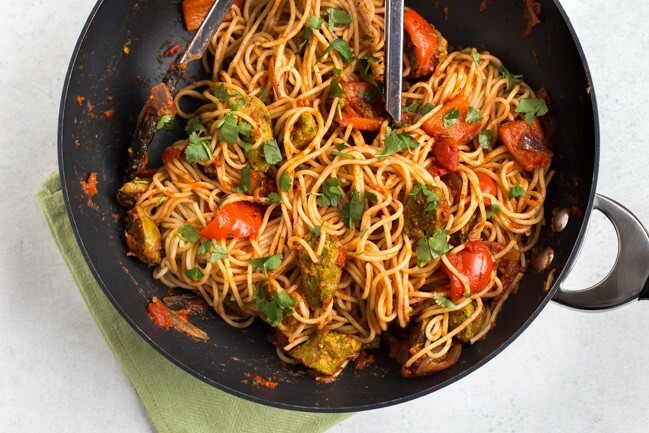 This curried sausage pasta is the perfect dish to keep entirely vegan. 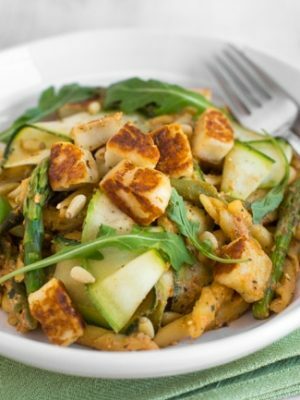 Of course, to make a vegan pasta dish, you could just omit the cheese from your favourite pasta recipe, but that might mean that it ends up feeling lacking. Macaroni cheese without the cheese is just… macaroni. 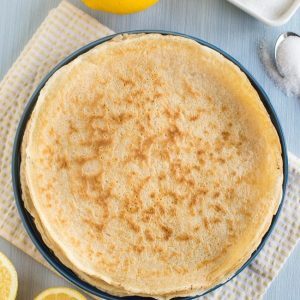 A better method is to go for a flavour combination that doesn’t need cheese in the first place! 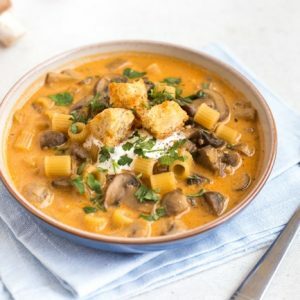 Italian-style sauces lend themselves perfectly to a generous sprinkling of cheddar or parmesan, but curry isn’t a flavour you’d usually associate with cheese, so it’s easy to skip the dairy without feeling like you’re missing out. The end result is still beautifully rich and tasty, with a warm curry flavour – suuuuper satisfying. 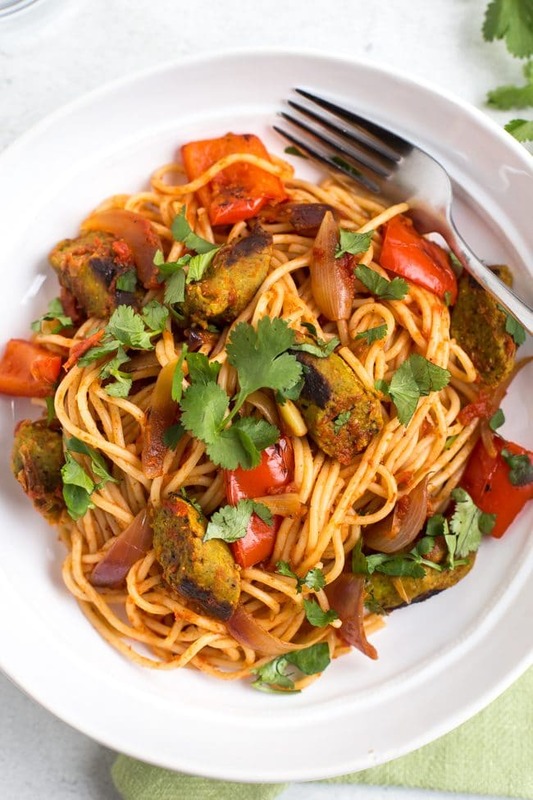 To add heaps of flavour to this pasta dish, I used the ‘Bollywood Bangers’ sausages from Heck. They’re a gorgeous Indian-style vegan sausage with loads of curry flavour! The ingredients list is awesome to look at. 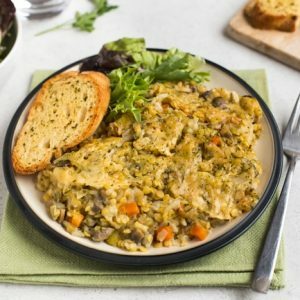 There’s no ‘fake meat’, just all sorts of healthy, wholesome ingredients – cauliflower, lentils, tomatoes, quinoa, spinach, even some chia seeds! But even if you’re a picky eater, you’ll love these sausages – all the ingredients are blended together into a smooth sausage-like texture. The flavour is amazing, and brings so much life to this simple pasta dish. 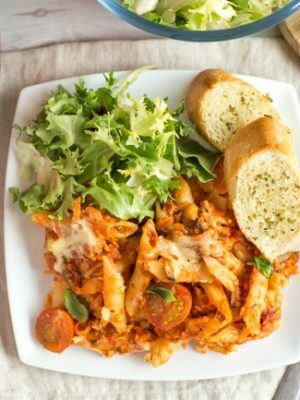 The recipe for this curried sausage pasta couldn’t be easier. Start by cooking up the sausages – they just need a few minutes in a frying pan, until they’re nice and crispy. I’ve also baked them successfully, if you’d prefer to use your oven! Then remove the sausages, and use the same pan to start on the rich tomato sauce. You can use two separate pans if you’d prefer to get both things going at the same time – I just like to save on washing up! 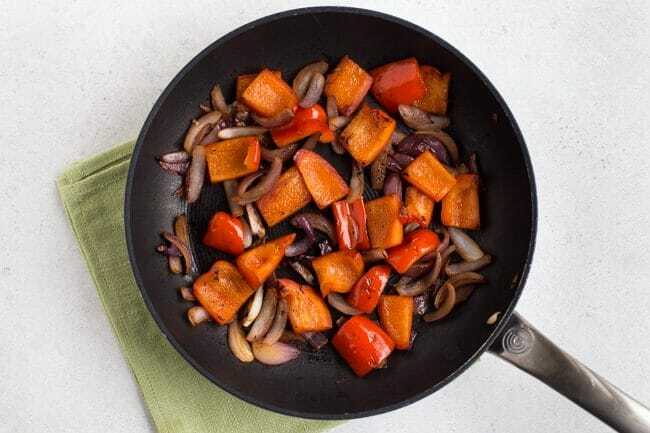 The curried tomato sauce starts with some red onion and peppers – cook them until they’re soft and slightly charred. 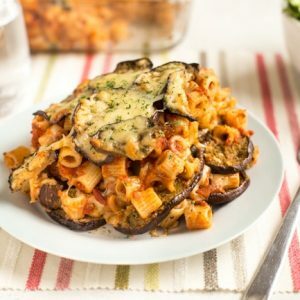 This char brings some lovely flavour to the dish! If you want, feel free to add extra veggies to your sauce – I wanted to keep mine simple so the Heck sausages could still be the star of the dish, but some mushrooms or cherry tomatoes would be nice additions too. Then just add a tin of chopped tomatoes, and simmer everything until it’s nice and thick and rich. You can always add a dash more water later if it needs it, but a thick sauce is a great place to start. This time I also added a spoonful of curry powder, to add to the warm curry flavour of the dish. Don’t forget plenty of salt and pepper! Finally, just mix everything together! Return the sausages to the pan (I chopped mine into bitesized pieces – on a slight angle, just to be fancy), and add some cooked spaghetti. A big handful of chopped coriander (cilantro) really brings everything together. 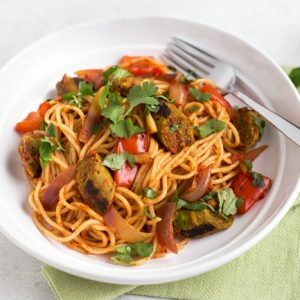 This curried sausage pasta is actually a pretty healthy vegan dinner option – lots of veggies, protein, and carbs, all in one tasty dish. Use wholewheat spaghetti if you want an extra bit of nutrition. What if I can’t find the Bollywood Bangers sausages? 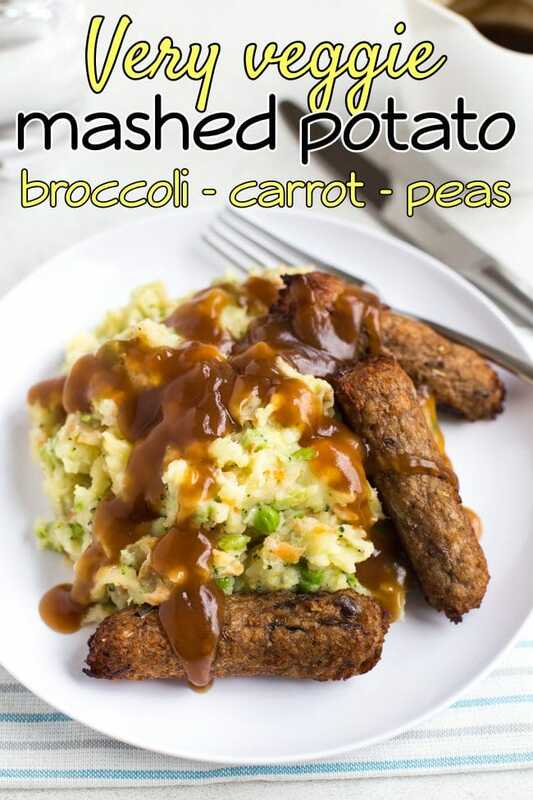 A lot of the flavour of this dish comes from those gorgeous vegan sausages from Heck – they’re super tasty, and really bring a big hit of flavour to every mouthful. They really are the backbone of this recipe. 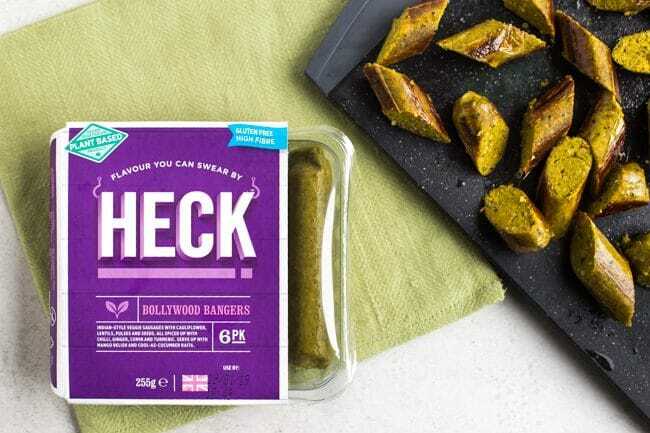 If you’re in the UK, you can find the Bollywood Bangers in Waitrose, Booths, Ocado, and Asda. It’s definitely worth tracking down these sausages to make this dish the best it can be! 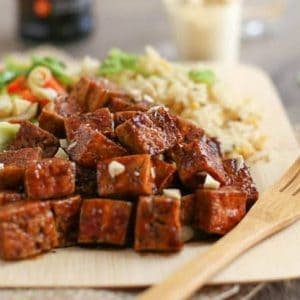 Or, if you’re not in the UK, and you’re using less tasty sausages, you’ll need to get some more flavour into the dish in a different way – try using a bit more curry powder, or some other spices, to make a really flavourful sauce. Heat a dash of oil in a frying pan, and cook the Bollywood Bangers sausages for a few minutes each side, until crispy and browned. Remove from the pan, and set aside. Add a dash more oil to the pan if it needs it, and add the chopped onion and pepper. Cook over a medium heat for 5-10 minutes, stirring regularly, until soft and slightly charred. Add the tinned tomatoes, curry power, and a good pinch of salt and pepper, and bring to a simmer. Cook for a further 5-10 minutes, until the sauce is thick and rich. While the sauce is reducing, boil the spaghetti in a large pan until cooked al dente. Drain, and set aside. 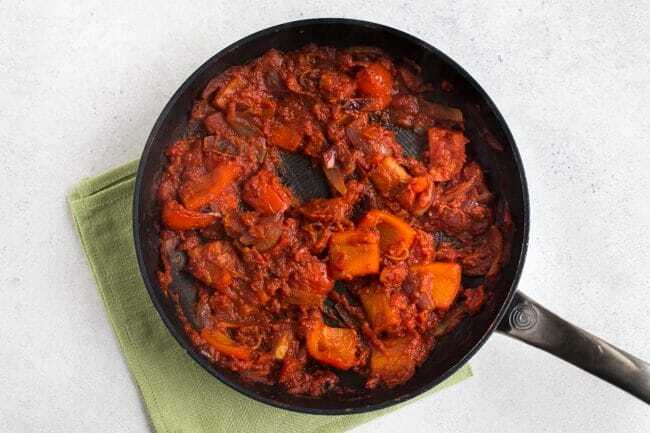 Cut the cooked sausages into bitesize chunks, and return them to the pan with the thickened tomato sauce. Add the cooked spaghetti, and mix well to combine. When everything is hot and well combined, serve topped with plenty of fresh coriander (cilantro). 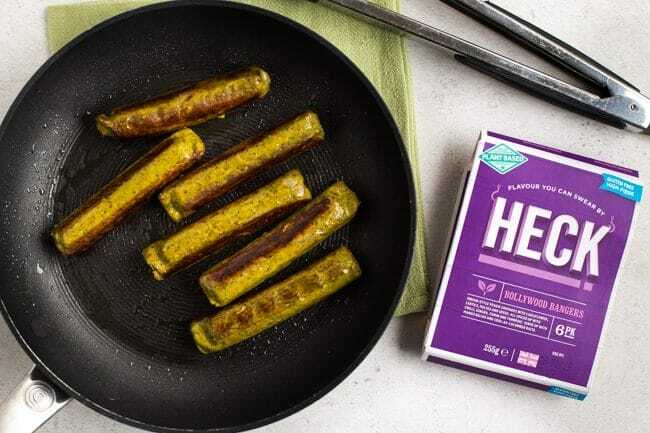 Want another way to serve your Heck vegan sausages? Try serving them alongside some very veggie mashed potato! I’m going Bollywood sausage hunting on Saturday in Asda. Wish me luck!